Showpiece RAF100 event scheduled for 1pm on 10 July in London. 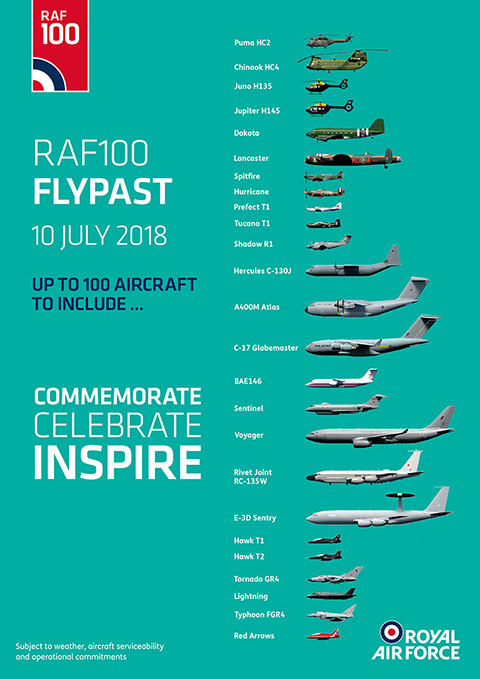 On 10 July, up to 100 RAF aircraft will perform a flypast on an epic scale over Central London to mark the centrepiece of the Royal Air Force’s 100th anniversary celebrations. Historic aircraft, including Spitfires, will join some of the RAF’s most state-of-the-art aircraft in this unique event. This flypast will be the largest concentration of military aircraft seen over the capital in recent memory, with the formation passing over Buckingham Palace at 1pm BST*. The mass display will feature a range of aircraft, marking different eras of the RAF’s 100-year service history, and will include the first opportunity for the general public to see the RAF’s next generation aircraft, the Lightning (to be confirmed). Ahead of the flypast itself there will be a parade of 1,000 RAF personnel and another 300 lining the route, representing the diverse roles played within the RAF through the generations. The parade will start at 11:25, marching up Horse Guards Road and The Mall towards the Palace. “This once-in-a-lifetime flypast will provide an iconic centrepiece for the RAF100 celebrations. In our centenary year we are commemorating those that have come before us, celebrating our current personnel and, ultimately, inspiring a new generation to write the next chapters in the RAF’s story.